Serious accidents, including deadly ones, involving jet skis and parasailing activities on the beaches of Da Nang and Hoi An in central Vietnam have raised safety concerns among beachgoers, as bans imposed by local authorities have proven ineffective. 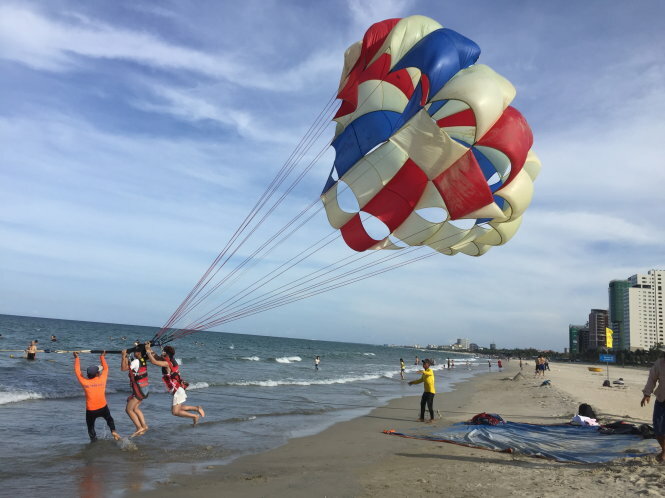 A ban on parasailing activities has been in place for more than a week in Hoi An, the tourist city of Quang Nam Province, but it just fails to stop thrill-seekers from participating in the extreme sport. At the famous An Bang Beach on Tuesday, droves of foreign tourists could be seen lining up for their turn to be strapped to a canopy wing, which gets airborne while towed by a speedboat to which it is attached. It took an Australian couple five minutes from making a payment of VND800,000 (US$35) until their turn to go parasailing, which involves being lifted dozens of meters into the air and occasional ‘water dipping’ for added excitement. Nguyen Van Son, deputy chairman of Hoi An, describes the game as “extremely dangerous” in light of recent accidents where parasailers got seriously injured. In 2016, a male tourist got trapped on top of a coconut tree after his canopy wing got blown away by strong winds. In July 2018, a child suffered from a broken leg and his father sustained major injuries after they got entangled in ropes used to attach a parasail wing to a boat during takeoff. Be, a lifeguard stationed on An Bang Beach, said he was not aware of a ban on parasailing activities in Hoi An as the sport has continued to be played without intervention from local authorities since the start of August. According to Son, all companies offering parasailing service at Hoi An beaches are not licensed to operate the sport, and therefore there is no guarantee that the ‘professionals’ they hire to instruct the players are qualified. Jet skis are also a regular terror on beaches in Hoi An and the neighboring city of Da Nang. While the sport is not banned in Da Nang, the municipal administration says it “does not encourage” the service due to the potential danger it poses to beachgoers. “Controlling jet skis can be a very exciting experience, and there’s a thin line between overexcitement and an accident,” said Phan Minh Hai, deputy head of the management authority of Da Nang’s Son Tra Peninsula. Last Thursday, a tourist was killed and two others injured when two jet skis crashed into each other on My Khe Beach in Da Nang. The owner of the resort that offered the service has refused to cooperate with authorities in investigations into the accident, Hai said. While jet skis in Da Nang can only operate within special zones defined by marker buoys, the same does not apply in Hoi An, where jet skis could be seen zooming through crowds of bathers at high speed without any safety precautions. “Ski riders get psyched up hearing applause from the ‘audience’ after their dangerous moves, making it very easy for them to lose control of the vehicle and crash into beachgoers," Be said.